I have to admit that I didn’t have time to watch the proceedings live, (because my bon vivette self was at an important theatre opening night,) hence no live-tweets. Alicia Keys’ look to host the show! Photo by Karen Salkin. The opening, with Camila Cabello and Ricky Martin and fabulous salsa dancers was great! Lady Gaga. Photo by Karen Salkin. 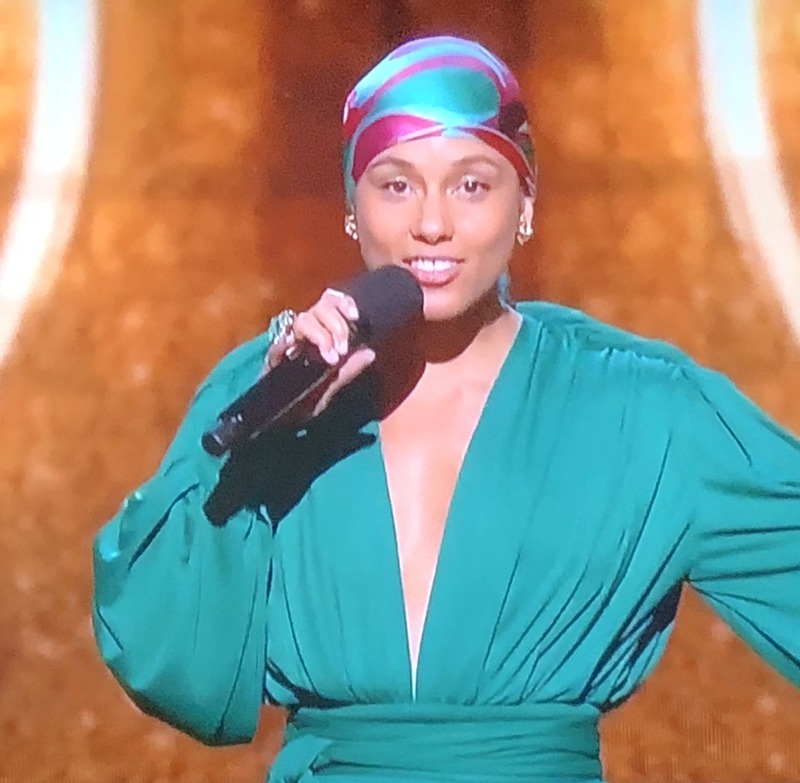 I hate to say this, but someone has to—Alicia Keys looked like a cancer patient…on purpose! Why isn’t everyone getting on her case for that choice, like the blackface controversy?! I used to love Alicia Keys because of her talent, but she’s just way too phony now. I can’t take it. 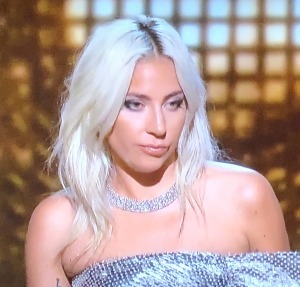 Lady Gaga looks like she’s a poverty-stricken hood rat. Jennifer Lopez should have been above the stupid bit that’s supposed to show girl power or the like. And why was she hiding her eyes? Jennifer Lopez. Photo by Karen Salkin. As always, get full-of-beans Jada Pinkett out of here! Why is she even there??? She’s not a music person. Michelle Obama should be ashamed of herself to participate in this nonsensical segment. But I was happy to see that she was wearing my favorite ring that I’ve been wearing for the past year. 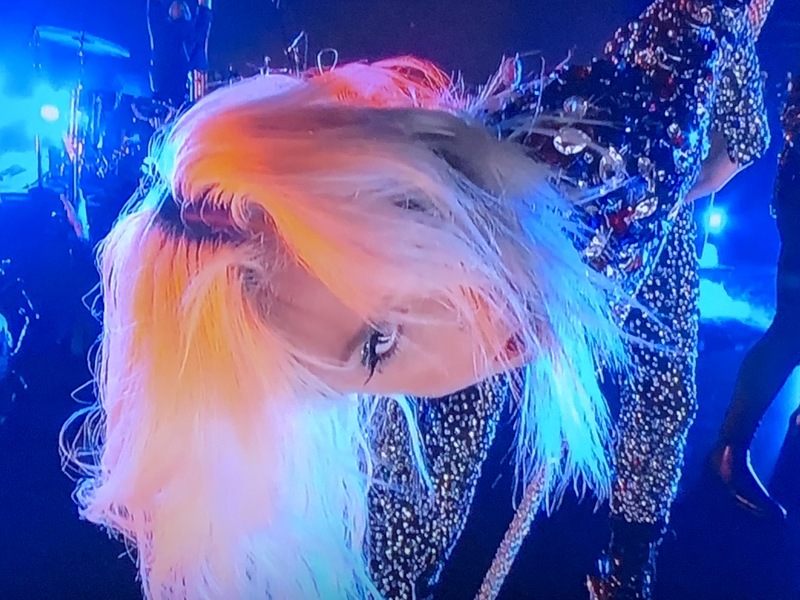 Lady Gaga’s end pose in her number. And no–this image is not skewed. See what Mr. X said about her performance later on in this review. Photo by Karen Salkin. Lady Gaga is also full of beans, with her desperate trying to pant during her acceptance speech! Alicia kept saying everyone is her “sister.” If she’s so desperate for a sister—she can have mine! Janelle Monae cannot dance to save her life. Finally something nice on this sham of a show! Alicia told us that, many years ago, John Mayer had given her the Grammy that he had won over her, because he thought that she deserved it more than he did! For the first time, I finally understood why he attracts so many girls. 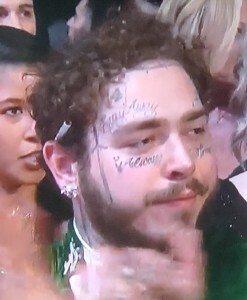 Post Malone, keeping it classy with that cigarette behind his ear! Photo by Karen Salkin. Post Malone may look ridiculous, but he sings great! Katy Perry was trying sooo hard in the Dolly Parton segment, yet she sounded awful. Dolly put them all to shame. Why does Miley Cyrus always want to feature her bare chest and stomach? It’s not attractive. Dolly’s so sweet. 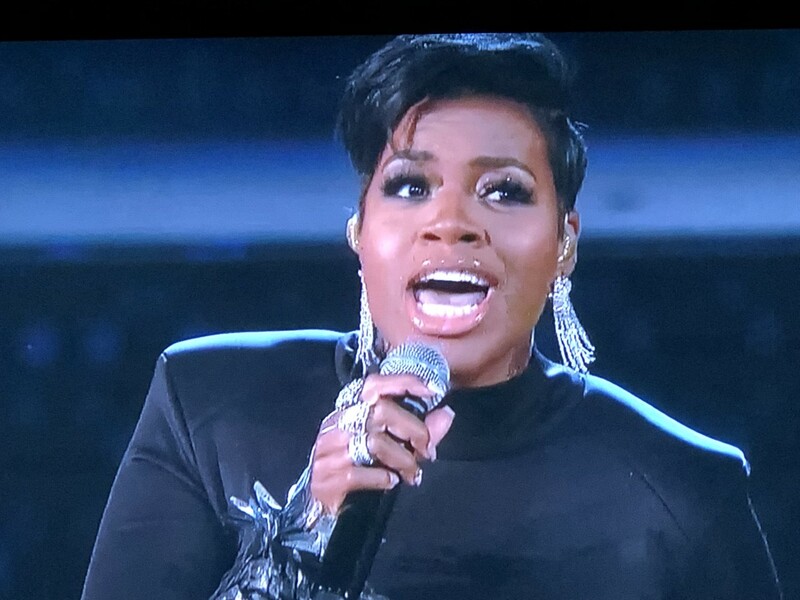 It’s nice that she sang with everyone in her own tribute! The BTS guys were adorable, singing along with Jolene. I hate her uber-pretentious moniker, but H.E.R.’s easy-going performance was one of the best. 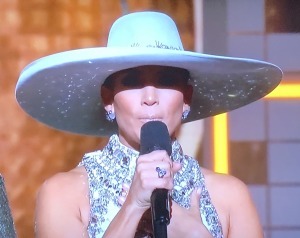 Besides that Mr. X said that Kacey Musgraves is very average, an assessment with which I agree, she looked like an idiot in her acceptance outfit. It looks like someone stabbed Big Bird to death. See what I mean about Kacey Musgraves’ outfit?! And did that dude second from the left think he was going to a Game of Thrones fete? Photo by Karen Salkin. Dan and Shay always seem so nice. And grateful for their success. 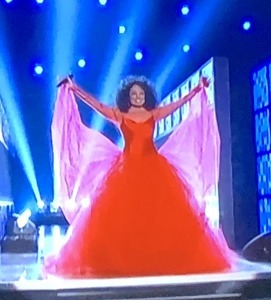 Diana Ross’ triumphant entrance. Photo by Karen Salkin. 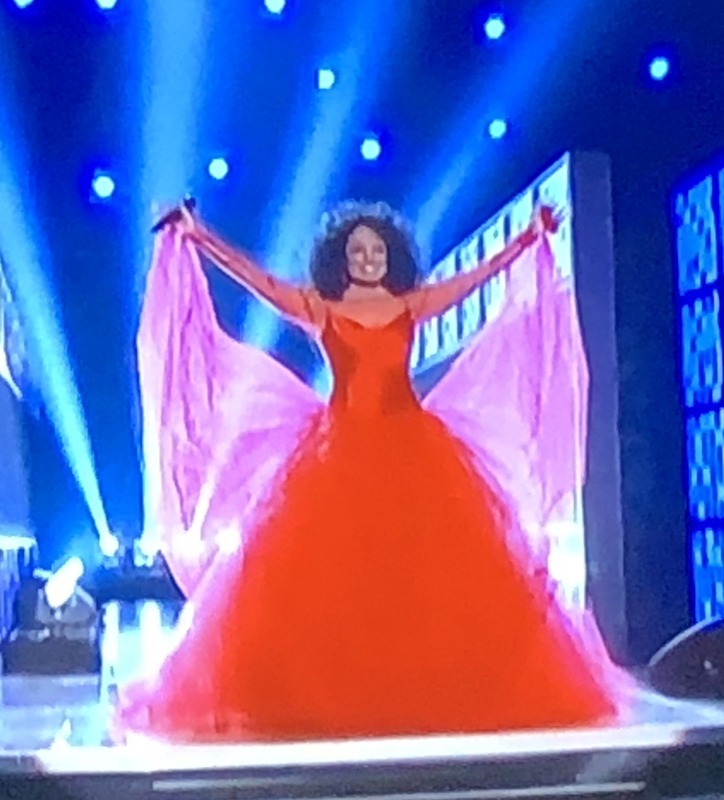 Even though Diana Ross’ performance was kind-of scream-y, she showed them all how to be a star, from the second she arrived on stage. It was a throwback experience, but it’s the only time I couldn’t look away to write even a one-word note. And her nine-year-old grandson who introduced her was so well-spoken! The best part of the whole night was the brief acapella duet between Smokey Robinson and Alicia Keys. 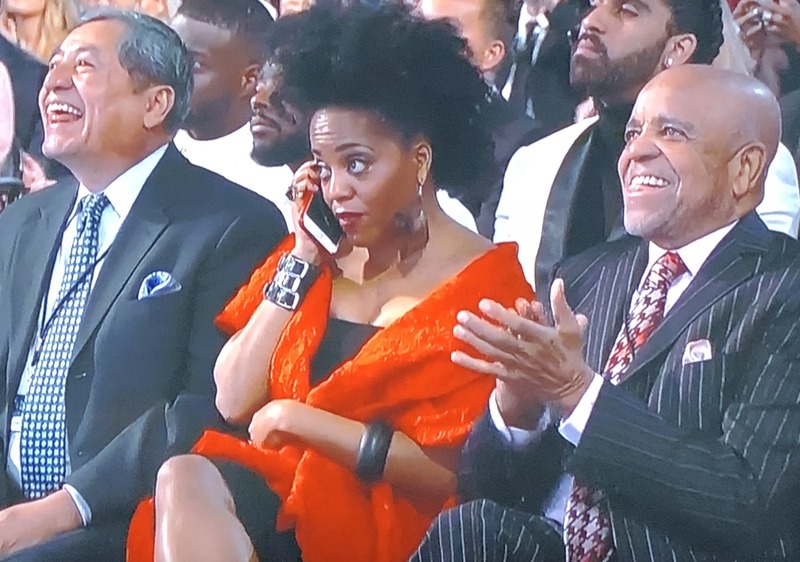 Diana Ross’ daughter on her phone in the front row! Photo by Karen Salkin. But, shamefully, Diana Ross’ idiot daughter (the one she had with Berry Gordy) was on the phone during it! In the front row!!! Now I’ve seen everything—Janelle Monae’s hair-do is…safety pins!!! I know that before the show, people were up in arms about JLo doing the Motown tribute, but she was the perfect one to do it, once I saw what it was. But it was strange that it was really more about her! I thought that BTS couldn’t speak English! But the one guy did great! But all but the main dude look like women! On purpose. What is up with that?! BTS. Don’t they all look like women, except for maybe the one in the middle?! Photo by Karen Salkin. H.E.R should not have received Album of the Year for something that’s not even an album!!! Even she said it’s just an EP! 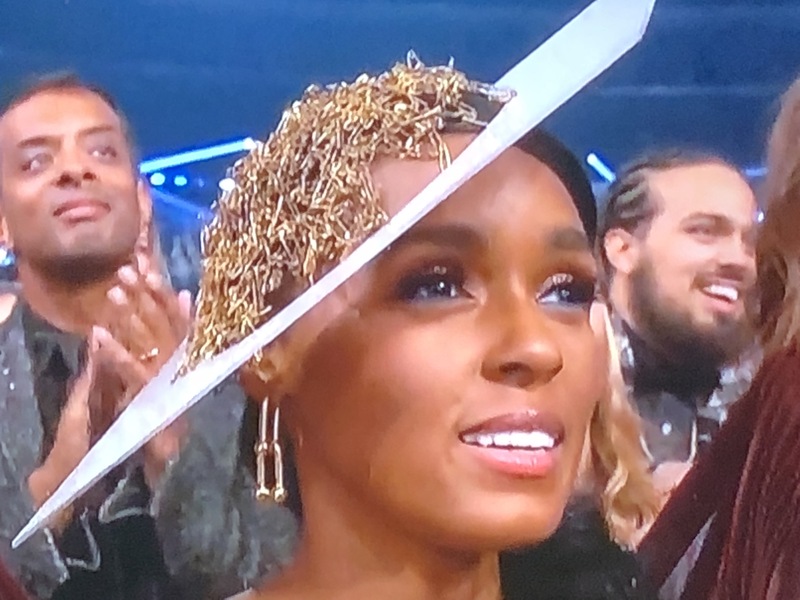 Janelle Monae’s safety pin “hair!” Photo by Karen Salkin. And she said, “I have no words,” but she’s the only one who had to be played-off for going too long! With her way too many words. Ironic, eh? I have never, ever heard of Brandi Carlile, but she was up for something like five Grammys last night! How is that even possible? I’m not a fan of Chloe x Halle. What a hilarious pairing—Alessia Cara and Bob Newhart presenting Best New Artist because they had both won it—she last year, and he in…1961! You go, boy! Dua Lipa’s safety pin dress, and perfect hair part! Photo by Karen Salkin. Why were there eight nominees for Best New Artist??? There have always been five. 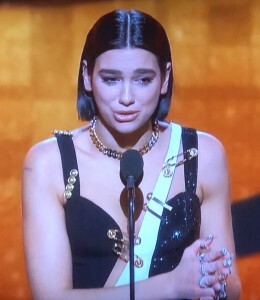 I’m glad that Dua Lipa won. She could have also won for Best Part of the Year! Now Dua Lipa’s dress is being held together by safety pins! I guess those little buggers are the “it” accessory of the year! 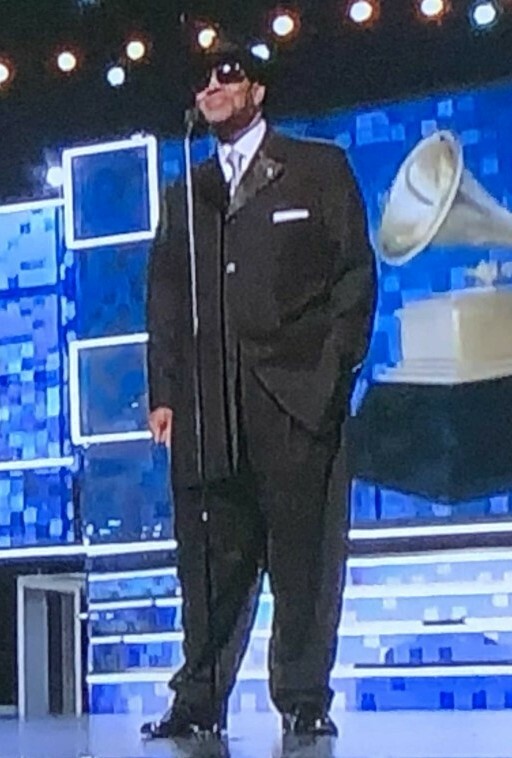 Jimmy Jam looks like a little kid, wearing his father’s suit. 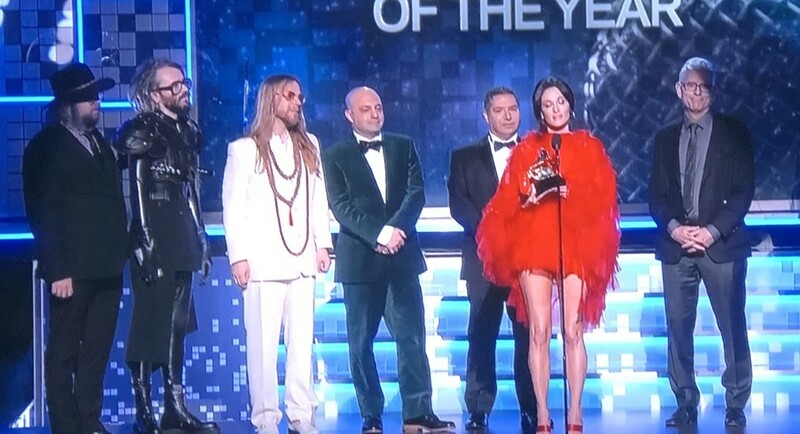 That was a weird tribute to outgoing Grammys President, Neil Portnow, because they pushed him out. 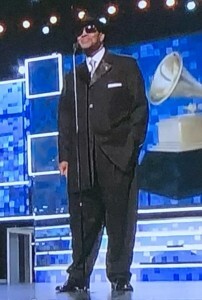 Jimmy Jam in his too-big suit! Photo by Karen Salkin. And he had to sell-out by saying, “…including some of the most thrilling new and legendary female voices of our time.” I hate that he had to give this crow-eating speech! How did Kacey Musgraves win Album of the Year, which is considered the biggest award?! This was a very unsatisfying Grammys. I’m glad I didn’t give up my big event to watch it live. I would have been so disappointed. There was not much real star power, like in days of yesteryear. It was such a snooze fest. I also feel really old because I don’t know who half of those people are. I agree with everything you said, except…I love Gaga. I thought she looked great. As for her performance, she was switching it up, since Bradley was busy winning awards at the BAFTAs. I found it fun. And as you saw on FB, I’ve been loving Brandi Carlile since 2005. It’s nice to see someone who has been in the business for a long-ish while, finally get some recognition. Can’t wait to read your Ragtime review!